(a) Deceleration sensors used for the airbag system are installed on various parts on the vehicle and calculate the deceleration rate of each part during a collision. 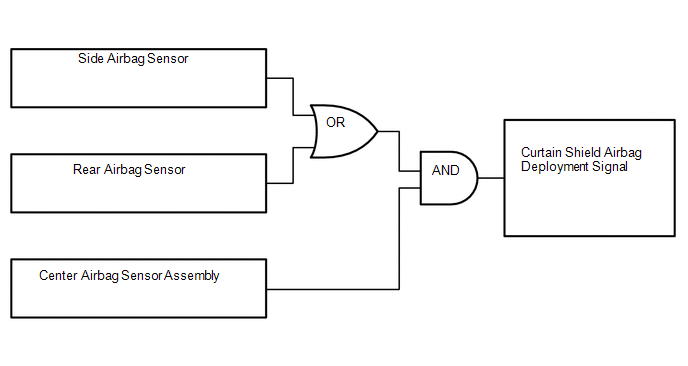 (b) Depending on the situation, the center airbag sensor assembly sends a deployment signal to airbag and pretensioner based on the information from each sensor. (1) Frontal collision signals are produced based on the information from the center airbag sensor assembly and front airbag sensors. *: In case of a frontal collision, the SRS ignition signal could be output with the deceleration sensor ON signal even without a signal from the front airbag sensors. (2) Frontal collision signals are used to deploy the airbags and pretensioners except the side airbags. (1) The side airbags are deployed based on signals from the side airbag sensors and center airbag sensor assembly. The curtain shield airbags and front pretensioners are deployed at the same time. Signals from the side airbag sensors or rear airbag sensors are received. Signal from the center airbag sensor assembly is received.